Conquer your fears, climb to new heights and celebrate life’s adventures. Can you confidently step into the unknown without hesitation? Can you seize the opportunity without reservation? 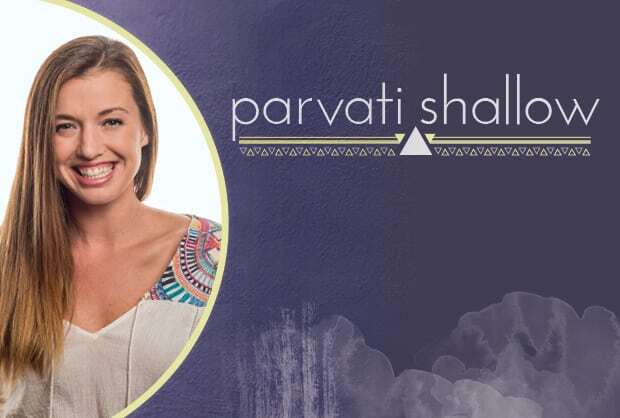 Parvati Shallow has found a way to quiet the voice of fear and to courageously dive into the unknown, creating a life of freedom, adventure, and joy. And now, she will teach you how to thrive. Parvati won a million dollars on the international television show SURVIVOR and is widely considered to be the best to ever play. Her elegant approach to the chaos of SURVIVOR resulted in CBS Television offering her a chance to host her own show: Around the World for Free. Having to rely entirely on the good will of total strangers, Parvati successfully navigated her way across four continents without a dime (the show was a hit, too). Parvati then took on her next opportunity — moving to New York to write and produce for CBS News. After much success in the newsroom, she left to build her own speaking and writing business but did so on her own terms — not knowing where the next paycheck would come from. Now Parvati will show you how to do the same: recognize your fears, dream big, create opportunity, and capitalize on it — even when doing so means overcoming seemingly paralyzing risk. She is living proof that the payoff is too great not to pursue. Let her show you the way. During her time as a journalist and Health Editor for CBS News, Parvati covered a topic close to her heart: addiction. Watching loved ones cope with addiction inspired her to learn more about it – the causes, the warning signs, and the treatment options. Through a special news series #14Days on the Wagon, Parvati spent 14 days without alcohol to stand in solidarity with those struggling with addiction and encouraged viewers to do the same. She spoke with experts on health, addiction, and recovery to learn more about what people can do to understand, identify and defeat addiction. She learned that our society is not set up for sobriety and that those battling addictions need support and connection in order to succeed in recovery. Heavy drinking and partying is a way of life for many college students, and recognizing when someone is really in trouble can be difficult in this environment. Parallels between the greater society and college campuses became apparent as Parvati worked on the #14Days series. Now, she is ready to share her findings to motivate students to help themselves and their friends. This keynote encourages students to understand the importance of building a supportive community for peers and loved ones that may be struggling with addiction and covers the root causes of addiction based on traumatic life experiences. In this keynote, Parvati addresses the dangers of co-dependency and discusses healthy lifestyle practices for students to adopt for themselves while helping others. In doing so, she illuminates the importance of compassion in becoming a force for change in the treatment of substance abuse on campus and in the world. how specific lifestyle practices can help them stay healthy and maintain good boundaries as they strive to help those that may be struggling with addiction. Alcohol affects each of us differently. Do you know how it impacts your body and brain and how many drinks it takes for you to start losing control? It’s estimated that 50% of all reported cases of sexual assault and violent crime involves alcohol use. How can we protect ourselves and our friends from being victimized? Do you know when and how to intervene? What if you are the one who needs help? In this keynote, Parvati Shallow focuses on raising awareness about the impact alcohol has on us as individuals. Using principles from prominent psychologists and scientific research, Parvati will teach audiences why, as college students, they are more vulnerable to the inherent dangers of alcohol abuse. She provides helpful advice on how students can feel empowered to make positive choices that create positive impacts on their futures. This keynote is a great way to help students develop the skills and to have a greater understanding of how to stay safe on campus throughout their college years. how to be able to effectively get help when in danger. College students are standing on the edge of the beginning their adult lives. More often than not, they have more questions than answers about what’s coming next. The fear of the unknown can be crippling to students who are unsure of their next steps. Parvati has learned that developing the ability to handle an unknown future with both intuition and courage is a skill. With the right tools, any student can learn how to relax and confidently face uncertainty without getting caught up in fear and anxiety. In her keynote How to Thrive in the Face of Uncertainty, Parvati helps students understand the importance of focusing on the things that go right in life. Through inspiring and personal stories of both success and failure, Parvati helps students learn to take courageous action, listen to their own inner guidance and understand that they only need one thing to go right in order to move forward to the next. how to keep moving when faced with obstacles by narrowing their focus on positive outcomes.